We invite students, faculty, and staff to share their experiences of the 2018 LMU Common Book with friends and colleagues. This event is open to all LMU campus community. Lunch will be provided. 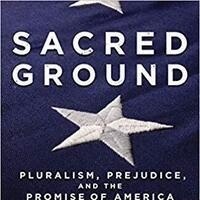 The 2018 LMU Common Book is Sacred Ground: Pluralism, Prejudice, and the Promise of America, by Eboo Patel. Patel's work explores the opportunities for cohesion, intimacy, and healing that interfaith dialogues can offer a community. Sacred Ground provides a brave space for engaging with the spiritual aspects of human experience as individuals, as families, and as communities. It is our hope that Patel's book will offer our campus a touchstone for discussing the diversity of religious experience at LMU, as both Americans and global citizens.